Front page of today's Buffalo News Trying to More with Less. 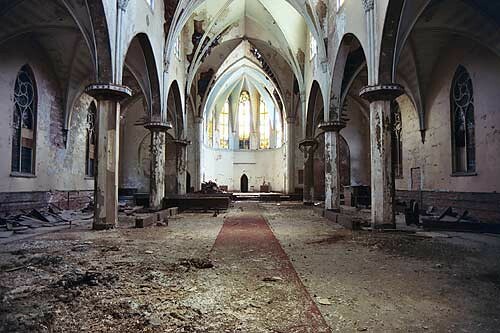 Based on the church flipping scandal of the 90's when the Buffalo Diocese closed the first round of churches and left many neighborhoods with rotting gothic hulks of brick and stone, why shouldn't we be expecting more of the same. I mean, is hope really a plan? Frequent readers of this blog have been following the story here in, Annals of Neglect, which is an attempt to document the various problems neighborhoods are facing as a result of the church closings. Catholic complexes used to dot the City's East side, now many of them sit abandonded, boarded, derelict and mostly vacant. Yesterday, a frequent reader of my blog and Chicago based architect David Steele wrote A Peek at Heaven and Possible Hell over at Buffalo Rising. Meanwhile the Bishop has no plans to sell the property at 79 Oakland. And yes there is still an outstanding housing court warrant out for Pauline Nowak, the mother of local attorney William Trezevant the presumptive owner of the former Transfiguration Church. Diane Dryja, a member of St. Gerard parishfor decades, doesn't want to see a repeat of Transfiguration Church,which the diocese closed in 1993 and sold. The church sits at the corner of Sycamore and Mills streets, idle and crumbling. "To see it standing there the way it is now, is heartbreaking," Dryjasaid. "That reflects on us being Catholics, Christians. We want to makesure the neighborhood doesn't deteriorate because of one of ourbuildings." Here's the round up from the Buffalo Blogosphere about yesterday's article in the Buffalo News. Byzantium's Shores has a few criticisms about the format and how the Buffalo News approach compares to what's going on with other NYS newspapers. Figmo, over at Buffalo Rising writes about the commerce and conversations. Alan over at BuffaloPundit included a picture of some bald guy. (Check out his piece about the Artvoice Geek Meet.) Gramma Jen from All Things Jennifer fame, (guess I'm buying beer, again!) gives us a ton of substance with a link to a Wall Street Journal piece about blogging in today's paper. She mentions her roomie, Erin, from, Erin Go Blog. The guys over at All Things Buffalo are getting things together at one of Buffalo's very few group blogs...Paul from Elmwood Strippers learned something new from the article, cool pictures further down from the Peep Show at the Hotel Lenox over the weekend, too. Nothing yet from the dean of Buffalo blogging, Alex Halavais or Craig from NorthCoast Online. Check out that cool pic! Ok, I'm taking a few hits today by calling out Jennifer as the Grandmother of the Buffalo Blogosphere in an article in today's Buffalo News by Steve Watson. Make sure to check out the other blogs that Steve mentions. While some of us are suburban and sometimes snarky, most of us are City folks and as you will see, rather opinionated. Common denomiator, we love Buffalo and believe her best days are just dawning. And yes most of have met off-line for coffee at one time or another and even got together last yearover beer and wings at the Anchor Bar for Buffalo's first BloggerCon. As soon as Warren from Omaha allows Buffalo Newsreporters to start blogging, like they do in Toronto we'll really seeblogging go to the next level here in Buffalo...Until then, check outBuffalo Bloggers for the latest buzz about Buffalo and be sure to checkout David Steele's latest post over at Buffalo Rising. A Peek at Heaven and Possibly Hell picks up on a theme that I've been developing over here in the Annals of Neglect. And a special thanks to Jen over at Jennimi for introducing me to Steve Watson. I just found out that Steve went to journalism school with this guy from the Financial Times, cool. Small world. 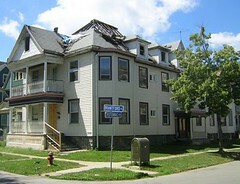 The City of Buffalo has owned this house at 93 Riley Street for the last four years. Driving by would you know it's for sale? Didn't think so. I spoke with the neighbors the other day. They had no idea the City owned it either. It's right around the corner from the emerging Midtown and Artspace area of Main Street. Here's the Google Map showing the way. Last time I checked most realtors have a sign and a website, but not the City of Buffalo. Call your Council person - 851-4200 - and ask them, " Why isn't the list of City owned property available on the City's website?" Or try this, "Hello, Byron? I think it would be a good idea if...."
While the demolition of existing structures on the City's East side has moved forward in erratic fits and starts like a crack whore trying to score, there are a number of buildings here on the City's near East Side that are just crying out for the right combination of ownership and tenant mix. Recently a new East Side blog, Broadway Fillmore Alive featured a story about one of my (not so) favorite City leaders and presumed East Side resident, Common Council President David Franzcyk. It's all about trying to squeeze more money for demolitions and totally failing to get at the the underlying causes of neighborhood decline. Notice the total absence in his resolution of specific number of residences that are demo worthy. I mean can these demoltions really cost exactly 10K. What I'm getting at is that no one really has the arms around this problem of abandonement and demolition. The City's Fire Dept. 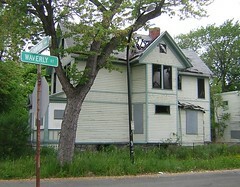 has one set of numbers relating to the number of abandoned houses in Buffalo, the Dept of Assesment another number and the folks on the City Hall's third floor in the Dept of Inpections are doing triage with all the resources they can muster. Yet, if we were serious about the problem of abandonement and demolition the City would be going after demolition payments and collecting on overdue court ordered demolition fees. Long on generalities. Short on specifics. 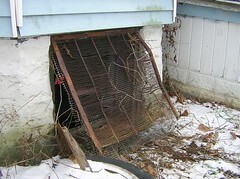 Establish a program that's been kicked around - "Deconstruct Buffalo" and reuse old building materials. Many readers of this blog are advocates of this approach. 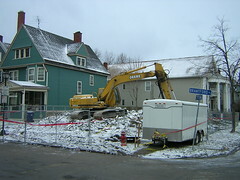 A year ago, 242 Koons Avenue was demolished. City tax payers footed the bill. Call Franzcyk's office 851-4200 and see if any payments have been collected. Just ask the simple question, "why not?" (The house's former owners are Bay Area, CA investors with the means to write a check.) 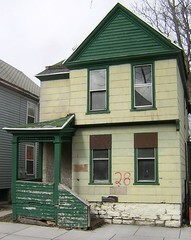 And then there's the total idiocy of the City taking possession of a three old burn-out at 198 Glenwood Avenue at last year's City tax auction. 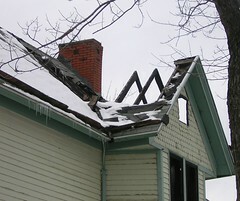 A warrant is still outstanding in housing court for the former owner. Now, guess who's paying for that demolition. I mean why not go after the former owner any longer? Of course there is the truly sad case of 2 Girard Place. Sickens me...and the history of the City's ownership of 669 Genesee Street is even worse. No marketing plan...just a 500K demolition bill waiting to hit the Control Board. And while David Franzyck has represented the City's most blighted neighborhood for decades, what has been done to attract private investment to the area and reverse the downward "Detroitization" of Polonia? One word, K-mart! More reasonable City leaders have told me that David Franczyk is the best Councilman the Delaware District never had. In any case he's spent far too much time trying to save the forest forty miles away in Perrysburg, NY than he has taking care of Broadway Fillmore, his district. Read all about here...it's the story you won't see anywhere else. 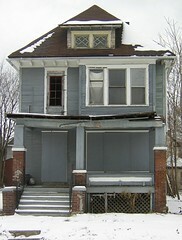 The problem of abandonment and demolition is getting worse by the week here on the City's East Side. And if we keep doing the same thing over and over again while expecting different results, well you get the idea. Come on over...drive or walk around the neighborhoods here on the City's East side and see for yourself. 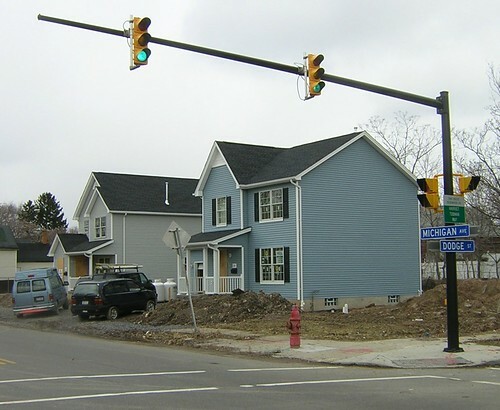 In November I posted - here, here and here - about development along Michigan Avenue on the City's near East Side. 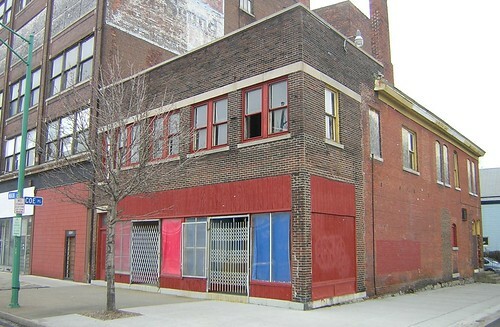 Michigan Avenue is just behind the emerging Midtown section of Main Street that features Artspace and a few recent posts about development in the Artspace Impact area, 1, 2, 3 and 4. There is a heavier concentration of these new builds in this neighborhood. Craig, the project supervisor for Rocco Termini told me 26 homes are just about completed. And the design is much more "urban" than attempts that first dotted the neighborhood 10 years ago. Many of those houses that originally sold for 80-90K are now selling for 25-30K after a few cycles of ownership and a foreclosure or two. Maybe the density of these new builds well act as catalyst to maintain and like omg...improve property values here a short ways from Main Street. While plans are underway to save the Hamilton Ward House from the wrecking ball, here's another house just across the street that the City plans to demo. 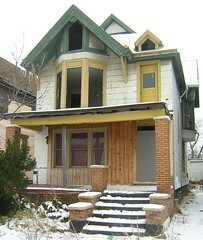 If anyone is interested in this serious rehab opportunity on what is sure to be one of the coolest streets in Buffalo, e-mail me and we'll see what we can do to keep the street intact and save this unique house. 1217 Main Street - A Midtown Café? 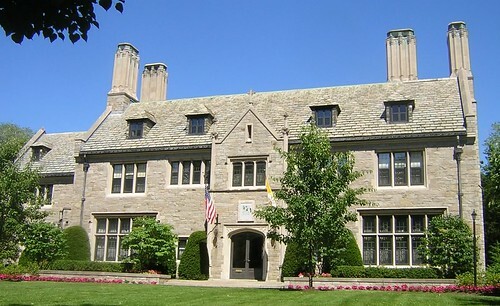 This Thursday at 11am at the Erie County Hall, 39 Coe Place will be sold to the higest bidder. Here's the link from JER Revenue Services. As I wrote last month I've known 39 Coe Place to be vacant for at least 10 years. A good friend lived next door at 33 Coe and I've had a chance to keep my eye on this one. 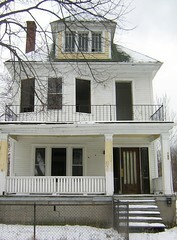 Here's a few current pics from the other day, front and back of 39 Coe Place. Here's the google map to get you to 39 Coe Place. Check the Artspace Archive for additional neighborhood information, especially Coe Place! Will blogs replace traditional main stream media outlets such as newspapers? An article in this weekend's Financial Times is getting traction in the blogosphere right now. The reporter, Trevor Butterworth, has put together a blog to gather criticism and reviews about his piece, "Time for the Last Post." Read that article and then check out Trevor's blog here, FTMagBlog. Read the comments for a totally refreshing spin on the state of the blogosphere. Lots of heavy duty cultural/media criticism regarding the role of journalists and bloggers. Sort of cool that a journalist for a major paper is playing both sides in the print and more interactive digital medium. Wonder how long it's going to take Warren Buffet to open the Buffalo News up to reporters' blogs. Would love to see that. You know they already do in Toronto! A few weeks ago I presented Midtown - Poised for Renaissance by Chris Hawley in Part III of my on-going series about Artspace and the emerging area around Main Street that we now call Midtown. While Chris Hawley has been working on the residential plan for the Artspace Impact Area, Stevan Stipanovich has just completed his planning document for commercial development along this stretch of Main Street. Both Chris and Stevan got huge kudos earlier this week from the City's top planner Tim Wannamaker while we all attended a meeting in support of preserving and renovating the Hamilton Ward House on Coe Place. Attention Buffalo Control Board members and Byron Brown - get Chris and Stevan a job! Net gain for Buffalo will like totally exceed their salary! They did this exemplary urban planning work as interns! Woodlawn Row Houses - Vandalized! Finally on way home today, (see previous two posts) I stopped by to check on the Woodlawn Row Houses. Documenting the urban erosion and demolition by neglect of this City of Buffalo owned local-landmark has been and remains the primary focus of this blog. Seems like over the weekend, probably sometime Monday morning, the Woodlawn Row Houses were broken into and judging by the tracks in the snow a few heavy things - probably the furnace and hot water tanks - were stolen. I know this sort of vandalism may startle some people and I certainly have never heard of this happening in the suburbs, the Elmwood Village or in the more prosperous areas of North Buffalo. Here in the 'hood...it happens often...look at the next few posts! 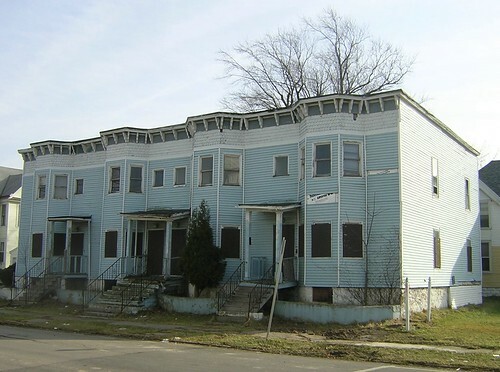 Remember, the Woodlawn Avenue Row Houses were designated a "local-landmark" by the Preservation Board here in Buffalo, NY and have now been owned by the City of Buffalo for three years. These row houses sit diagonally across the street - google map - and less than 100' from the main entrance of the curent home of Waterfront Elementary School and the future home of Performing Arts High School. 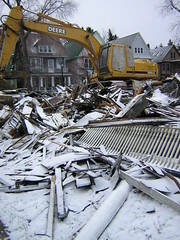 I've been photo-documenting the long slow demoltion by neglect of the Woodlawn Row Houses since March 2004. This is one of my favorite recent pics...from September 2005. No sooner had I snapped a few pics of 198 Glenwood (see previous post) that I noticed 195 Glenwood was wide open, too. Here's the google map showing the proximity to the future home of Performing Arts School which is currently being used by the students and teachers of the Waterfront School. The side entrance door is missing and the front center window is gone, too. I wonder what else is missing. 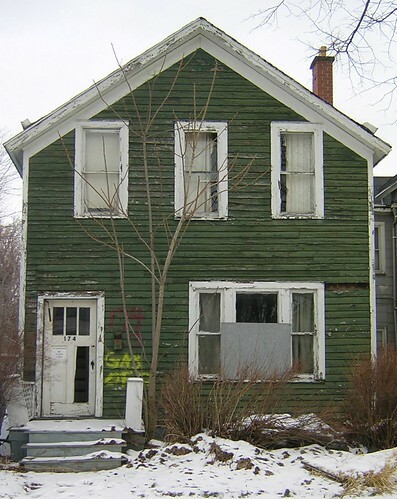 And just across the street at 174 Glenwood, the City of Buffalo still owns this house which was picked up at the City's October tax auction in 2004! See for youself how much property the City of Buffalo owns on Glenwood Avenue. Seems to me that going after the owner for demolition costs would be more effective than using tax dollars. Then again, what do I know. Just around the corner on Michigan Avenue, the scene of multiple demolitions last year, this house at 1466 Michigan is wide open. There's a housing court warrant for the owner's arrest on this one, too. Here's the google map, showing the proximity to the future home of Performing Arts High School. Which is currently being used by the students and teachers of Waterfront School. Here's the story about "demo season" here in Masten. Lots of pics, here! 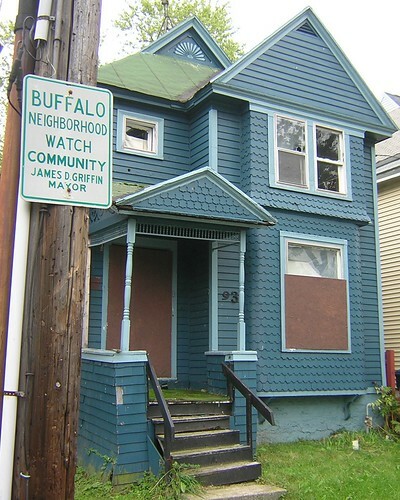 On the walk home I noticed that the windows are now missing from 125 Woodlawn Avenue which was just taken back by the City of Buffalo at the October tax auction. 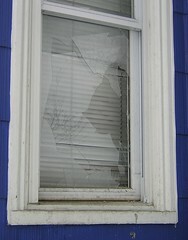 And 123 Woodlawn now has a broken front window. 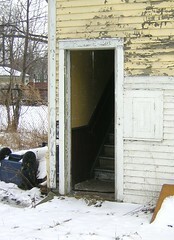 This house has been vacant for 18 months and is owned by Rev. Richard Stenhouse's organization Bethel CDC. He's also a member of the Buffalo Fiscal Stability Authority, better known here in Buffalo, NY as the Control Board. 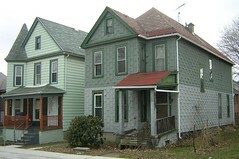 Both of these houses are directely across the street - google map - from the kids attending Waterfront School. This is what they look at when they look outside...did you look at something similar growing up? Didn't think so. This morning I had the opportunity to talk with Paul Johnson about his plans for 60 Brantford. I first wrote about this place shortly after it burned last May and a few weeks ago I wrote this short post which is a brief comparison of how West side and East side "burn-outs" are handled. Well last week the demo crew was in full swing. I managed to snag a few of those spindles and some metal work after bringing the crew coffee from Aroma just around the corner. Paul plans three town houses for the property. After chatting with Paul I returned to the 'hood...198 Glenwood and the subject of that East side vs. West side comparison. 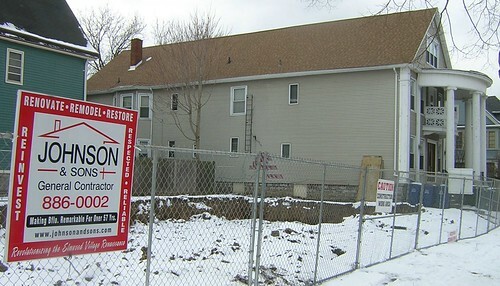 198 Glenwood is still open, burned and complete eyesore more than three years after the fire. Here' s the google map showing the proximity to the future home of Performing Arts High School. I just checked the City's website to confirm ownership and noticed that the City took the property back at the recent October tax sale. So...please tell me like who is paying for this demolition. Last time I checked, there was a warrant out for the arrest of what is now the former owner of 198 Glenwood. I've been working with Preservation Coalition board members Cynthia van Ness, Todd Mitchell and Chuck LaChiusa over the past few months in developing what I think is a rather unique opportunity to see and experience the City. Click on any of the red points to see the details and pics. We'll be starting the tour in Buffalo's Midtown on Coe Place at 11am and winding our way around some of the lesser known portions of the City's East Side. Lunch in MLK Park with Olmsted folks talking about our City's park system. Bring a picnic lunch and plenty of fluids! Rick's Cycle Shop will be providing tech help along the way. The tour will end at Old Edition's Book Shop and Cafe around 3pm. The tour is scheduled three times this summer. Mark your calendar for the following dates. Additional booking details to follow. Make sure to check out Chuck LaChiusa'a site, Buffalo as an Architectural Museum and the Preservation Coalition's site for all sorts of information about Buffalo and its architectural legacy. The full Preservation Coalition's tour schedule will be available soon. Tim Tielman and the Campaign for Buffalo has already released their summer tour schedule. Check it out, here. Tim Tielman just let me know that his Summer 2006 Tour Schedule will be finalized soon...meanwhile keep checking out Tim's blog, over here. Chris Hawley has been posting there, too. Had a long conversation with Steve Watson, Buffalo News reporter, yesterday. He's preparing a piece about Buffalo bloggers, why we do what we do and web 2.0 stuff. We talked about my praises for a recent Mary Kunz Goldman piece, over here. And we both agreed that the sort of thing that the Toronto Star does with blogging is the bomb. Check out this...from the Toronto Star...Reporter Blogs! Make sure to check out how the sister site thestar.com: webmaking does the blog thing and folks in TO know all about the web 2.0...(del.icio.us, too!) Imagine how totally cool it would be if Warren Buffet would allow local reporters to interact with readers here, on-line. I had an opportunity to talk with Geoff Kelly, Artvoice Editor, at the caffé this afternoon. It was like he was totally listening in on the conversation I was having with Steve Watson. Look for lots of changes to the interactivity of the Artvoice site in the weeks and months ahead. Geoff, good to have you back in town! Just caught this on Toronto Star...what a paper should be! Peter Goddard, Toronto Star Visual Arts Critic does slideshows about art gallery openings...too cool! I was in Housing Court last month asking Judge Nowak for a little more time to see if I could generate some interest in 2 Girard Place. The answer...NO. Time is up. I've failed in my 11 month long battle to generate some interest in saving this significant part of the urban landscape. You've probably seen it dozens of times, it's just before Best St. inbound on the 33 on your left. Here's the google map to help with directions. I first wrote about 2 Girard here in March, in May, in July and more recently in November. I've taken an interest in the property as it's really close to the former German Roman Catholic Orphan Home just across the Parkway at the corner of Dodge and Parade. 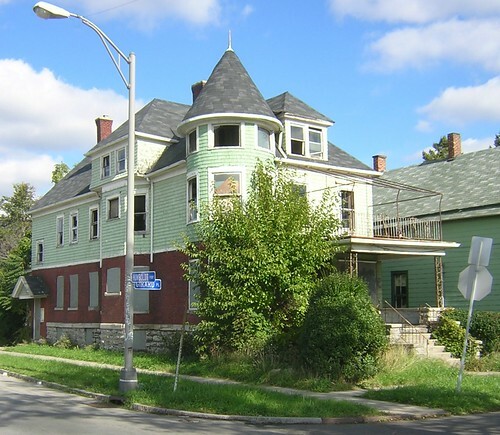 I know that neighborhood is sort of tough to know and get around for an insanely stupid reason.....the scar, Buffalo's monument to malfeasance and bad municipal planning. I posted this piece about American Vertigo and Bernard-Henri Lévy last week. His descriptions of Buffalo are way off and wrong. More than one person has told me that it seems like he may have just done a "fly-over." There are no boarded-up office buildings in Buffalo, NY - BHL writes "boarded-up office buildings, disintegrating or about to be torn down"
There are dozens of cool restaurants - BHL writes "not one good restaurant to dine in"
Robert Coles just designed a significant new library BHL writes "The library is on the verge of financial collapse"
The most significant architectural feature of the Central Terminal is the clock tower! BHL writes "an enormous abandoned sugarloaf"
I recieved the following e-mail from David Steele, a Chicago based architect and frequent contributer to Buffalo Rising. Here is what I have to say about the French guy. I have seen some blogs on this book in the past and have read the entire Buffalo segment and some of the Detroit segment. Though some of what he says certainly can be found in Buffalo I get a distinct sense form the story that he never set foot in Buffalo or is perhaps mixing Buffalo up with Detroit. Part of his article talks about walking through abandoned mills at Bethlehem Steel. (mills thathave been torn down for over 15 years) He describes the train station as a sugar loaf. This description is more descriptive of Detroit's abandond train station. His description of the abandond office buildings is also more akin to somthing you would see in Detroit. 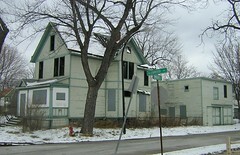 In the Detroit segment he talks about the Wright houses. Huh? In Detroit? I do not know if there are any Wright houses in Detroit but I do know that Detroit is not known for its collection of FL Wright buildings. Finally, Buffalo is not a bastion of activity and the streets of downtown can look very deserted but I can come up with a list of at least 25 decent restaurants within a few block area. David also just let me know that Bernard-Henri Lévy will be a guest on Chicago Public Radio tomorrow, 2/8/06 around noon. They stream, right here... http://www.wbez.org/ I called the program director to see about getting a call in to BHL. Too late, it was taped last week. I've posted the Woodlawn Row Houses on Craigslist, here in the Toronto section. My sitemeter is going nuts with hundreds of hits in the past few days. I've shown the property to a number of interested people in the past few months. I've also posted in Pittsburgh and Ann Arbor. Let's see what happens. Today, I had unique hits of my blog from Buffalo's City Hall, morning, noon and a few hours ago. Someone's working late. I'll repost in some other cities so long as the Law Dept. leaves me alone. The state of the blogosphere is strong. Check it out. The blogosphere is over 60 times bigger than it was only 3 years ago. New blog creation continues to grow. We currently track over 75,000 newweblogs created every day, which means that on average, a new weblog is created every second of every day - and 13.7 million bloggers are still posting 3 months after their blogs are created. In other words, even though there's a reasonable amount of tire-kicking going on, blogging is growing as a habitual activity. In October of 2005, when Technorati was only tracking 19 million blogs, about 10.4 million bloggers were still posting 3 months after the creation of their blogs. I attended my first non-social New Millenium Group meeting the other nite down at SpOT on Chippewa. Chris Hawley was hosting the Downtown Action Group Meeting. Tons of highly informed discussion and debate about urban planning issues in the downtown core. Chris is also doing the heavy lifting regarding the City's agenda for Midtown, the area around the Artspace. I posted about that, last week Midtown - Poised for Renaissance. The following pics were placed on the table during the meeting of the new HealthNow project happening behind City Hall. I learned this parking ramp will become the largest parking ramp in upstate NY and that the strange positioning of the building takes advantage of maximizing particular portions of the tax code than it does aesthetics. I first wrote about this project back here in June and July, "Get Ready to Duke it Out" and in August, "We've Been Duked!". Don't forget this post in October, "Getting Duked Live" that features the Duke Realty webcam that you can control and view the contruction project from City Hall. Still no discussion or public debate about Duke Realty's landgrab of 6.5 acres. Get ready to Duke it Out and We've Been 'Duked', Really! Look at all the beautiful "suburban style" office parks Duke Realty has built. 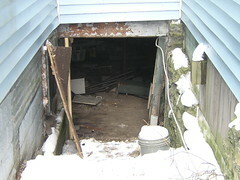 Here's the latest pics showing the long slow demoltion by neglect of a City of Buffalo owned local-landmark. 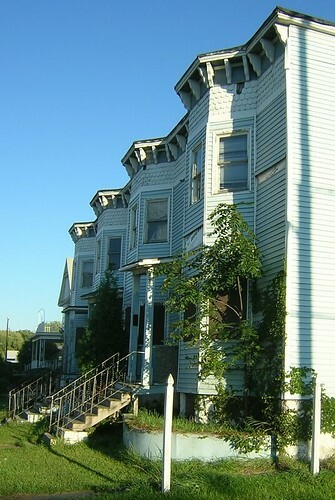 These row houses are significant as they represent one of three examples of rowhouses here on the City's near East side. Check out this 1926 map of the neigborhood and all the rowhouses. The fact that they are wide open and directly accross the street from the future home of Performing Arts High School should be a concern all of Buffalo. The fact that NYS in conjunction with the Buffalo Board of Education will be spending 28 million dollars beginning this June in the renovation of a new signature school seems to warrant some attention to this decaying example of our architectural heritage. The last little pic on the right, click it, and you'll see evidence of the gas company digging up and removing the gas line to the buiding. I observed them doing this last week. If I didn't know better, I'd think that was an indication of demo plans...anyone know? 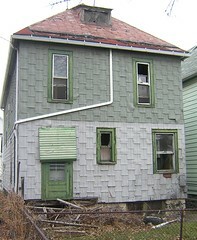 The mild winter has not been kind to the Woodlawn Row Houses. 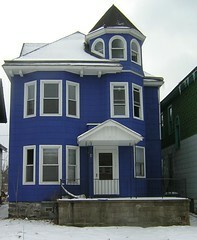 As you can see the lovely blue vinyl siding is falling off, probably due to wind damage. 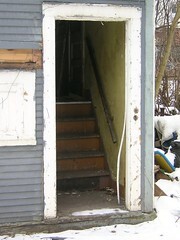 (A building permit was issued for the installation of this siding, despite the "land-mark" designation by the Preservation Board. 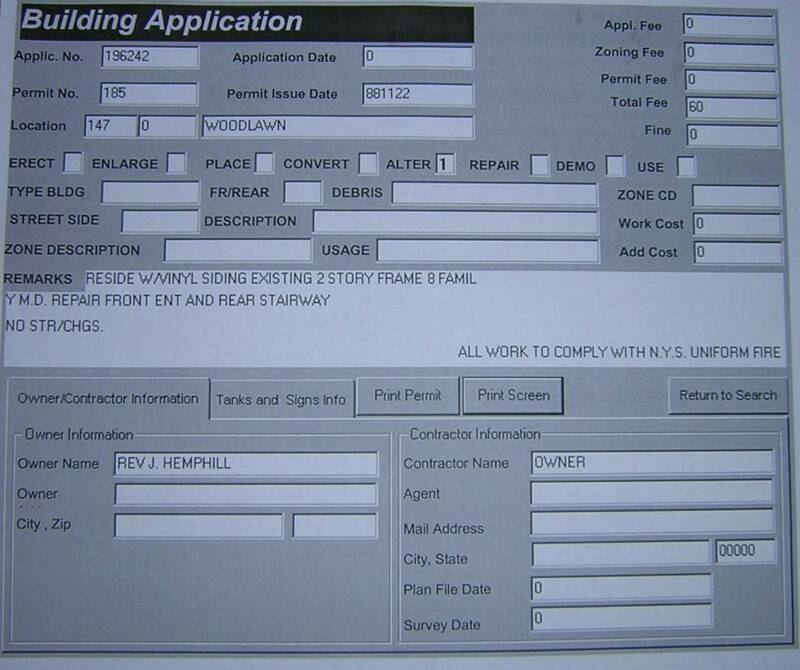 See copy of the building permit.) Warm weather has brought out the vandals, too. The rear door is wide open. As I tried to seal it today, my foot went thru the rotted porch floor. And the window that I had re-boarded just two weeks ago has been pried open again. There are four additonal houses right here in the neighborhood and less than a block away from the school that are wide open...it's hard to keep-up with my boarding efforts. If you are new to this blog, I've been keeping track of the long slow demolition by neglect of this City owned local landmark for two years, since March 2004. Here the pics and past posts. If you are an out-of-town investor and have reached me thru a Craigslist posting...e-mail and I will make arrangements for a neighborhood tour! Have you forgotten about the petition? Please consider signing it. Thanks. Back in June I began wondering if the property at 60 Brantford, where there was thru the roof fire on May 13th, would be addressed quicker than the problems over at 198 Glenwood Avenue. I posted an up-date in July. I linked to that post in a comment that I placed on Buffalo Rising last nite. It's part of a series of comments regarding the recent developments at 504 Elmwood and some praise for Paul Johnson. He's developed some cool places along Elmwood recently and according to Council Member Golombek Paul has recently purchased 60 Brantford and will demo the burn-out and build rowhouses on the site. Last summer, I met with neighbors near 60 Brantford and attended the Housing Court session where Joe Golombek was advocating for the prompt resolution of this problem. Next to a school, just like 198 Glenwood is two short city blocks away from the future home of Performing Arts High School. Here's the google map showing the proximity. The question of course is why does it take longer to properly address a burn-out on the City's East Side. I'm re-posting for a number of reasons including that I got some pretty hot comments about my June and July rant this evening after linking over at Buffalo Rising.